Think of all the fun you can have at your Halloween party with this funky and super easy vodka shooter. The Bloody Shirley Temple takes the fruity, sparkling flavors of the innocent Shirley Temple and twists it into an amusing party shot that is definitely for adults only. The shot is incredibly simple. It combines a blood red, cranberry-flavored vodka with a citrus soda. The key, however, is in the vessel. There's no need to grab ​a shot glass because you're going to drink it out of a syringe. It's a fun party novelty and can work for any occasion. Fill each shot syringe with 1 ounce of vodka. Fill a pint glass (or other tall glass) half-way with chilled soda. Place the vodka-filled syringe into the soda and serve to the guest taking the shot. To take the shot, the drinker either shoots the syringe directly into their mouth then chases it with the glass of soda, or the shot is injected into the glass of soda and everything is drunken quickly together. Will you have a black light at the party? Switch the soda out for tonic water. Quinine is the essential ingredient in tonic and it makes the soda glow under black light. Displaying the bloody syringes in glowing water is a pretty cool effect that will add to the party's atmosphere. The Vodka. Frugal drinkers are going to love the vodka used in the Bloody Shirley Temple. 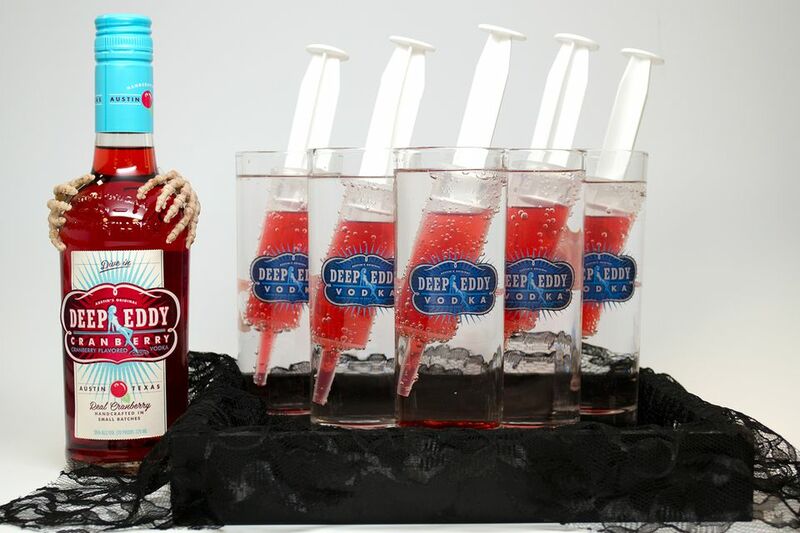 Deep Eddy has a great line of flavored vodkas priced just under $20. That means you can get about 25 shooters out of a single bottle and each will cost less than a dollar. In this case, the vodka of choice is Deep Eddy's Cranberry Vodka which is one of the best available of that flavor. It is the "blood" that is used to fill the syringe. If you're going to use another vodka, make sure it's red because clear vodka simply will not have the same effect. The Soda. The other ingredient you need is a lemon-lime soda. This could be Sprite, 7-Up, Sierra Mist, or your personal favorite. If you like, go with a sparkling water or the diet version of the soda to cut a few calories. The vodka-filled syringe is the best part of this shot and they are readily available. Most party stores will carry them, particularly around Halloween, because they have become a popular alternative to serving Jell-O Shots in plastic cups. The syringes that are designed specifically for party shots are larger than those for medicinal uses. Most will hold between 1 1/2 to 2 1/2 ounces and many have caps so you can fill them before the party. Because this shooter is liquid and not gelatin, this is a very important feature to look for in the syringes you buy. Without the lid, the vodka will drip out. Be sure to rinse the syringes before using them to remove any manufacturing particles. Also, the sooner you clean them out, the easier it will be. During the party, consider having a bowl or bucket of water to drop them into and let them soak once your guests are done.